A concise anthology including a wide range of Renaissance music. Medieval music in its cultural, social, and intellectual contexts. The Renaissance era saw a significant ferment under the banners of humanism, discovery, and reform, deeply affecting music and the way it was understood. Renaissance music in its cultural, social, and intellectual contexts. Richard Freedman's Music in the Renaissance shows how music and other forms of expression were adapted to changing tastes and ideals in Renaissance courts and churches. Giving due weight to sacred, secular, and instrumental genres, Freedman invites readers to consider who made music, who sponsored and listened to it, who preserved and owned it, and what social and aesthetic purposes it served. While focusing on broad themes such as music and the literary imagination and the art of improvisation, he also describes Europeans' musical encounters with other cultures and places. Western Music in Context: A Norton History comprises six volumes of moderate length, each written in an engaging style by a recognized expert. Authoritative and current, the series examines music in the broadest sense—as sounds notated, performed, and heard—focusing not only on composers and works, but also on broader social and intellectual currents. 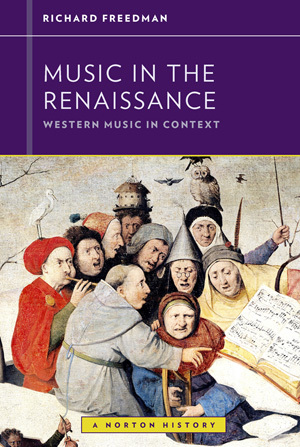 Like the other volumes in the series, Music in the Renaissance brings a fresh perspective to the study of music by emphasizing social, cultural, intellectual, and political contexts of the music. Richard Freedman looks far beyond the notes on the page or the details of composers’ lives to embrace audiences, performers, institutions, and social settings. For example, the text shows how new technologies of music printing in the Renaissance permitted composers to align notation with sound, causing audiences accustomed to aural transmission to rethink the concept of a musical work. Along with the other volumes in the series, Music in the Renaissance is designed for maximum flexibility in the classroom. The text may be packaged with the accompanying 27-work anthology, with Strunk’s Source Readings in Music History, or with Norton Critical Scores, all at a significant discount. The text is also available as a low-priced ebook.